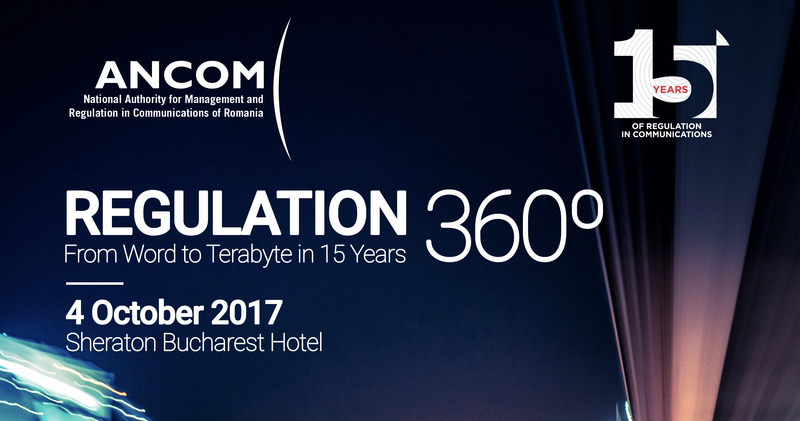 On October 4th, 2017, ANCOM organizes a new edition of its international conference, entitled “Regulation 360⁰ - from word to terabyte, in 15 years”.�The event will take place �at the Sheraton Bucharest Hotel, starting from�14.00 pm. 2017 brings along another anniversary for the telecom sector in Romania, as we celebrate 15 years from the setup of the independent regulator. Therefore, this year’s conference is the perfect opportunity to mark this anniversary and to bring together all the Authority’s partners during these 15 years: public authorities, Romanian market players, representatives of the European Commission and of BEREC, as well as representatives of fellow regulators around the world. Structured by three sessions, the conference aims at creating a framework for discussions on the main regulatory trends in the field of electronic communications over time, and on the evolution of the telecom industry needs, with particular emphasis on the European state-of-play and on the best regulatory practices. Discussions will explore topical issues, while also giving a prospective look on the likely shifts of regulatory approach in the years to come and on the anticipated challenges, as the telecom sector undergoes rapid and significant changes impacting the economy and society as a whole. Participation in the conference is free of charge, based on invitation, upon online registration. Due to the limited availability of seats, early registration is strongly recommended to ensure your participation.